This day on Oct. 25, 1838, French composer Georges Bizet was born. Despite living only 36 years, he attained quite a celebrity status, mostly after his death. Ironically, at the time of the premiere of "Carmen," which became his most famous work, Bizet was convinced the opera was a flop. Critics mostly scorned it and even condemned it as being without melody. Among the more noticeable examples of corps playing Bizet was Santa Clara Vanguard's 1990 production, which was based more on Rodion Schehedrin's "Carmen Ballet." (That work, which re-interpreted Bizet's music with strings and percussion, is often what most people think of when they consider the music of "Carmen.") Another conspicuous example was Madison Scouts' 2005 "The Carmen Project," which transported the storyline of the opera to modern times, including two opposing gangs and a female guest dancer who joined the all-male corps. 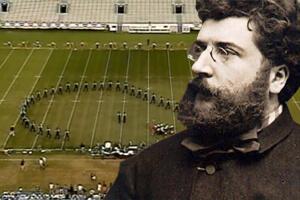 Today we remember Bizet with the Glassmen playing "Intermezzo—The Mountain Pass" from "Carmen," which was part of the corps' 1997 production, "The Age of Gold." Watch additional videos on the DCI Fan Network YouTube channel.